﻿ Schmidt Boat Lifts & Docks Inc.
Schmidt Boat Lifts & Docks carries lifts from many different manufacturers to suit different applications. Please feel free to contact us for assistance on which lift will suit your needs & application. 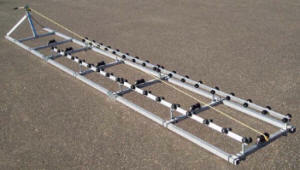 RGC Beacher Railways are available in aluminum 4000 lb & 6000 lb modesl & a galvanized steel 4000 lb model. Both the aluminum & galvanized steel models require low maintenance, offer high corrosion resistance & are easy to operate. Railway systems are ideal for use in minimum water depths & on waterfront properties with restrictive building ordinances. Constructed of marine grade aluminum or galvanized steel. Carpeted full length pivoting bunks support the boat's hull. 4000 lb railways are offered with 40' of straight track & 200' of galvanized wire rope. 6000 lb railway is equipped with 20' of straight track & 200' of galvanized wire rope. Electric power drives (with or without remote control) are available for each system. 15 year limited warranty on aluminum structure. 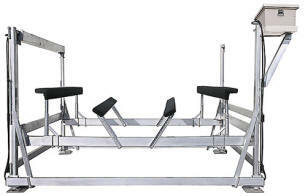 Capacities from 1000 to 2600 lbs. Free up dock space & protect the hull of your small boat or PWC with this easy-to-assemble rail lift. Sets up almost anywhere in minutes. Slide-N-Go is as simple as its name. 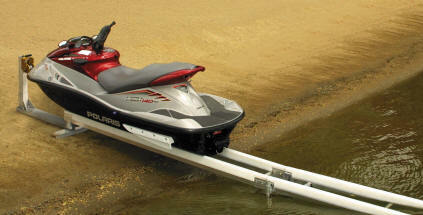 Slide your watercraft down the non-scratch plastic glides & crank it back on in seconds. The basic model can be quickly expanded with an add-on track extension. A sufficient amount of cable strap is included with the winch to accommodate the use of track extensions. 1200 lb maximum load capacity. Heavy duty aluminum construction--strong, low weight, maintenance-free. No-maintenance extruded plastic track glides with UV protection. 20' winch strap with hook. 3:7:1 winch ratio for easy operation & quick recovery of craft. Weighs 116 lbs, 10' bed length, overall length is 13.7' (including winch), track width is 20" (outside). Copyright 2017 Schmidt Boat Lifts & Docks Inc.